Today Breguet watches are made in the Vallée de Joux, the centre of advanced mechanical horology. 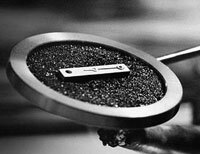 The Breguet workshops bring together extraordinary resources to handle the essential aspects of watchmaking. The concentration of specialised knowledge and technology covers movement construction, parts manufacture and watch assembly, to ensure an authentic product of supreme quality. 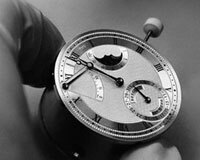 Equipped with watchmaking tools that A.-L. Breguet could scarcely imagine, his successors in the Breguet workshops combine avant-garde processes with closely guarded traditional techniques. The constant modernisation of their equipment reveals the motivation of the craftsmen who build the Breguet watch, pride in their work. Their workshops provide the technical environment where man and machine live in symbiosis. Like musicians in an orchestra, Breguet's watchmakers tune their instruments to the frequencies of time to play the themes A.-Louis Breguet wrote two centuries ago. Although equipped with the latest optical aids and measuring apparatus, the men and women who build Breguet watches still depend on the traditional tools that can only come to life in the practiced hands of a craftsmen. And watchmakers still keep their old bow-lathes in the bottom drawer of their workbenches, hoping they'll find a pivot that needs an expert's attention. Watch production is divided into a dozen very different workshops. In one, massive presses exert tremendous forces to cut tiny metal components. In another, removed as far as possible from the sources of vibration, numerically controlled transfer machines mill complex shapes in metal to tolerances of a few microns. Concentration is palpable in the dust-free atmosphere of the assembly and casing-up workshops. The silence is intensified by the faint hiss of a burner or the whisper of a file as a watchmaker works some play into a too-precise component. Breguet watchmakers regard exactitude as the sacred duty of their art. Behind individual methods lies a common commitment to achieving the highest standard of workmanship through constant refinement. Applying techniques that pre-date machines, they work quickly and precisely to create instruments in harmony with the most demanding score of all, the silent music of time. 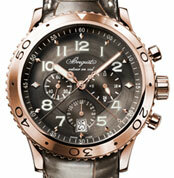 Breguet's approach to watchmaking preserves the individuality of each watch in a world of standard products.